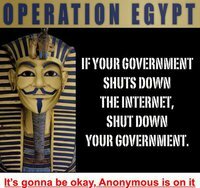 Its international, used in egypt when they banned Facebook & twitter. I have not verified this personally but it comes from a source I trust. With so much happening any trick that might be useful should be applied. “We send emails to all human rights and media organisation to make them aware of the situation unfolding in Egypt, in relation to the missing people, who maybe under arrest or being tortured. We would be grateful for more suggestions….